I’m a new member of the community and I have been browsing several places while knowing this place better. I have seen that, as usual with OER, the license favored is CC-By and there is also a signature for some members advocating it. Also is good to know that “it is critical to the success of the Rebus model that we shape our tools and resources in response to the needs of the community, rather than making assumptions.” , because in our experience CC-By as a tool is not enough. I will explain this and the alternatives. Licenses are about making clear stuff that matters. Most of the early practitioners and members of FLOSS communities saw certain inconveniences with the CC “legal translation” of FLOSS values and practices when applied outside the field of software . Many of us saw for example that the discussion regarding transparent and opaque documents (those regarding source code availability of the work ) where not present in any of the CC licenses, despite of being a concern in the definition of Open Content. So, we have a widely used set of licenses that doesn’t reflect the diversity of community concerns. Instead of giving account of such diversity, CC-By as only option conforms with the minimum and the lack of access to the source code of the work, creates practical problems in exercising the freedoms Open Content is supposed to enable, particularly the ability to transform the content, as explained in detail in projects that tried such transformations with works under CC-By license but without major concerns about offering source code beyond HTML, but clearly not authored in HTML (see the Data Journalism Handbook, in Spanish, for and example of such problem and a ways to overcome it). To make things worse, the argument about why only CC-By is the unique license that enables “real Open Content” is only made in comparison with other families inside CC, and without deeper development against examples of pretty successful projects under other licenses (like Wikipedia), disregarding them only by the “virality” of SA clause. In my case, I have found that a license that reflects my concern with source code of works to make derivated and extended works a practical reality is the AFL Academic Free License, which permits derivated works to be relicensed, as soon as they release their source code (after that it could be even closed). So I see the the discussion is pretty complex as far for being solved, if we want to give account of marginal voices and diversity in the Rebus and other OER communities. I hope to contribute to that discussion in the future. one of the worst things that happens to free software or free culture is license proliferation. license proliferation produces a balkanisation of reusable content, which is the opposite of what we want. if we dont get licensing right the first time, then hopefully we get there as quickly as possible. this is not a critique of the academic free license-- it is however, a substantial argument for staying with the de-facto standard of cc by. the simple answer to your question is “probably, yes.” cc by is enough. i happen to use permissive licensing for my own source code, so again for that, cc by is enough. 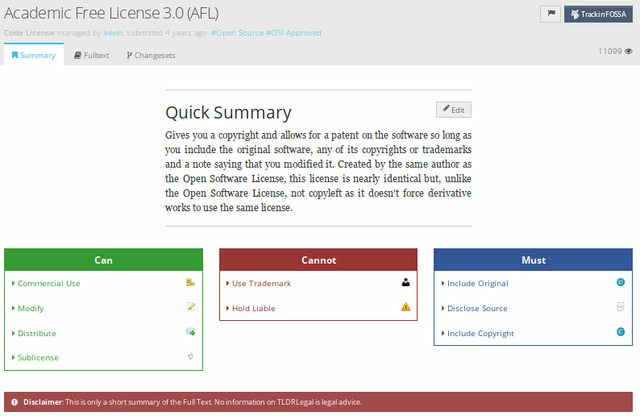 to apply copyleft to oer, the oer standard really ought to allow for the most relevant software licenses-- you should be able to use the gpl for your source code, which will take care of your concerns about it. in short, release your software under the right software license, and cc by should suffice for the rest of your oer work. admittedly, i am not familiar with the oer movement encouraging people to use cc-by for software. the creative commons faq says that the cc licenses are not compatible with free software-- richard stallman tells me that cc by is compatible with gpl 3, and he intends to contact cc about their faq. if anybody knows of any page that encourages people to use cc by for oer “source code” id like to know. if by “source code” you mean things like odt formats versus generated pdfs-- then i agree that redistributing/copyleft of “source code” is a best practice, though im not certain how viable that distinction is for non-software forms of “source code,” if any. i dont think this is necessarily a complex issue, so much as a number of well-intended people have made it overcomplicated. the reality (and the best thing to do) probably is simpler than it seems. @figosdev Thanks for keeping the conversation. The issue is this: we already need to deal with license proliferation. The issue is here and by only favoring only what license, that doesn’t reflect properly the diversity of communities concerns (particularly regarding formats and technology) we are making the problem worse by hiding it. The term “Source Code” means the preferred form of the Original Work for making modifications to it and all available documentation describing how to modify the Original Work. Licensor agrees to provide a machine-readable copy of the Source Code of the Original Work along with each copy of the Original Work that Licensor distributes. Licensor reserves the right to satisfy this obligation by placing a machine-readable copy of the Source Code in an information repository reasonably calculated to permit inexpensive and convenient access by You for as long as Licensor continues to distribute the Original Work. So, because we already have license proliferation, that accounts for the diversity of concerns of several communities, shouldn’t a OER project recognize it, offering several licenses and giving routes to traverse its combination beyond only the Creative Commons movement? (works uder CC-By can be combined with those under AFL, for example). At least, we, in our local hackerspace are going to use dual licenses (CC-By and AFL) to revive this discussion. Maybe in future releases of modifications, we are going to choose AFL and drop CC-By to show how this license doesn’t give account of the concerns in our community. And thus, our next locally produced OER will be a practical exercise on license diversity and its scopes. @offray.luna dual licensing is one way to address this. i didnt recommend it because if you dual license cc by and afl, it (usually) has the weaknesses of both-- this is most relevant to your concerns about copyleft. i also technically suggested two licenses, but not for the same work-- i wouldnt call this “dual licensing” because its really single licensing for two different purposes and two different works. license proliferation mostly comes from misunderstandings about existing licenses, or an organisation wishing to push something in a different direction-- not always through a need. occasionally of course, there is a true need for a new license. i would stress scepticism towards any such need, but they do sometimes arise. imo, people are prone to trying to make “licensing” do things that could be done by other means. with your concerns about copyleft however, the only real solution (within the existing oer paradigm, that is) is probably to use copyleft for source code, and cc by when appropriate to your needs. to me, this is not about whether cc by is “enough” for oer, but whether your source code really falls under the “oer” umbrella. what youre looking for (ive looked at your site) is free software licensing. but thats no reason to not participate in oer when the shoe fits. its not that i think oer licensing suits every community. the lines between free software, open source, and free culture (somewhere in there, oer) are more pronounced than ever. i do think cc by suits the oer community-- and i am interested in detailed arguments (from anybody with the time or interest in making them) why cc by would not suit oer-- this opinion isnt set in stone. please note that i think the hackerspace is a good idea, i applaud and encourage your use of free licenses, and im (always) interested in the place where these different efforts meet together. if you are concerned about copyleft, perhaps leaning towards afl is the right decision for your group. if the group produces more free software than textbooks, why the stress on compliance with de-facto oer standards? i try to learn from everyone, and i assure you this is not one-way advice. i will probably be giving your post some thought all week long. hackerspaces are the best, i wish you the best of luck with yours. an additional note: although im quite fond of opencontent.org, it is a now-defunct organisation that has ceded its goals to creative commons-- and been succeeded by open knowledge foundation, and definition of free cultural works. generally speaking, i think oer is on the right path. specifically to the opencontent.org efforts to introduce copyleft to non-software, i think a very strong case needs to be made for it. the really big problem with copyleft for non-software that cc by (and oer) neatly avoids, is the difficulty in navigating the requirements that results in lower participation in the production of oer works. if a more permissive license results in significantly greater participation, then copyleft is not what oer wants. but for your software, there are great arguments to be made. in a collaboration, a license that allows many more people to particpate is also subject to network effects. diversity is something you want with participants-- but not with licensing. “diversity in licensing” means exclusivity in participation, and making participation more exclusive (fewer people can or will reuse the work) requires a really good reason, to go with the higher cost. considering the headway oer is making, the reason needs to be something that happens “in practice.” i suspect that the reason david wiley gave up on open content, is that he decided it was an alternative to something that was truly working well enough-- but i only assume this. i believe the founder of opencontent.org now works at or even leads lumenlearning. Dual licensing here will be a mean to an end: showing that CC-By is not enough for people that really care about making the work practically modifiable by others. The first iteration will have dual licenses, so the work can be showcased in places that only advocate for CC-By, but probably we will have further versions only with a license that really reflects our concerns about making the source code available. I agree, is not dual licensing in that case. We have encounter that need in real cases already. This remembers me the phrase coined by anthropologist Susan Leigh Star on how infrastructure is relational and only in invisible when it fails. For copyright lawyers licenses is their theme, while software is infrastructure, for hackers is the other way around. For learners and educators licenses are infrastructure and learning is their matter. That shows the relational aspect of infrastructure. And the fact that nobody cares about how or where WiFi is, except when it fails, shows the second aspect. In our practical needs CC-By has failed us in reflecting our concern for source code of modifiable works (being them software or anything else). For example, in the case of the Data Journalism Handbook, we had to reverse engineer HTML content to put them into a real modifiable source code (Pandoc’s Markdown) to make the content multi format/device (adding PDF and EPUB). Usually works like those start in the Global North and are “disseminated” later to the Global South in the form of translations. More importantly, the invisible infrastructure make adaptation and conversation go into one way (from Global North to Global South). The CC-By license tells that you can extend the work, but HTML doesn’t help into that really as an example of the Poor Technical Choices mentioned in the Open Content Definition, that makes the work less open are shown in case like those (And lets not talk about centralized infrastructures like GitHub, hosted in the Global North, a more complicated that needed for most of the distributed teams. We have taken another approach using simpler "pocket infrastructures, but that would be for other forum post). In my experience, people do licensing because they want to express their concern about something (or lack of): modification, credit, profit, or infrastructure. As said, the discussion about infrastructures where lost in the early days of “transplanting” FLOSS dynamics to other cultural works, as has been criticized openly (see links in this thread about it). Infrastructure normalize relations and because it was taken out of the most popular licenses (CC family), the normalized relationship was that source code only matters for software, and for everything else the liberties are theoretical, because, in practice nobody has to release the source code, so interested parties need to reverse engineer it (as we have done). We plan to show other way, where legal and technical infrastructures care about source code to make modification a practical liberty, not only a theoretical one, as we already did with the Data Journalism Handbook (DJH), but, this time not only in Spanish. For me there is no a OER community (singular) but OER communities and that’s where I think that CC-By doesn’t suit them well (too much diversity for a single license). And hopefully here we are making detailed arguments with particular case studies about such ill suitability. Our hackerspace started in 2010 and was founded from members of the FLOSS and activists communities that is active since early 2000’s (the time when I started also to explore and build OER). So we have a long spectrum of concerns, since almost two decades, with different licenses for that: some are suited to software, some to hardware, some to OER, some to data. In all of them, we care about source code, in the most general sense (the representation of a machine readable form used to create, edit and extend such works). Some of us see hackerspaces as learning spaces in a pretty practical sense, but also from a theoretical point of view (following Wenger’s definition of communities of practice and even more close work from Schrock about hackerspaces as learning in disguise). Also is a place for developing critical digital citizenship literacy from the margins (not a University, Research Center, or traditional educational setting). So we produce constantly OER, just because we exist, but we don’t do it in the classical way. Most of them took the form of wikis and/or source code repositories, but now we are refocusing on books (like the DJH) and the upcoming booklets, because even in a post-print world which is multidevice and policentric , books occupy a central place and are a bridge with other formats and places. I believe in your good intentions and desires. Thanks for them. @offray.luna Sorry, I need to split this, because this software doesn’t like long format reflections. And I need to wait 2 minutes until I “win” reputation 2 (a perfect example of infrastructure disabling participation). Here comes the second part (Quotations are from @figosdev, two post away). I don’t think that copyleft is a too difficult requirement for participation, as Wikipedia shows. Also I think that CC-By is not enough as the Data Journalism Handbook has shown in our particular case. But notice that AFL works can be modified and even anyone can re-license them, as soon as they provide the source code of the first modification they do. So is not strong copyleft (like GPL). Is a statement (as any license) about what we care about: source code availability, and the possibility to (de)construct, and even profit, while giving proper credits (even without keeping the same license for future derivate works). As I have said, in the transitions, something is lost. The fact that Open Content is defunct doesn’t invalidate their legal and technological concerns to make content really open. As some say, our world is not the best that we can have, is only the surviving of many possible worlds from the past. Showing that the concern from source code is important for some marginal voices and places, in some alternative licenses, is showing that the present world still reflects the concerns of the multiplicity of voices from yesterday and today, even if they don’t occupy the central place that is usually dedicated to the visible central “winning” discourse (CC-By, GitHub or whatever occupies everybody’s mind as the “de facto” standard). Wikipedia is a stronger case for copyleft, but again, I’m not trying to make the case for copyleft, only for non “viral” source code availability. Also I don’t care much about participants numbers, but I care a lot about participants agency, which is diminished by the lack of source code. My argument is instead that diversity in licenses enables (or not) diversity in participants. That’s why we don’t have a single license for anything (software, content or whatever). and making participation more exclusive (fewer people can or will reuse the work) requires a really good reason, to go with the higher cost. considering the headway oer is making, the reason needs to be something that happens “in practice.” i suspect that the reason david wiley gave up on open content, is that he decided it was an alternative to something that was truly working well enough-- but i only assume this. I don’t know about David’s reasons neither. But I have experienced practical cases (DJH and others) where the default visible and popular license diminish agency and future participation. In the next booklet we will show how to create source code repositories for booklets and how to recombine singular works into complete booklets for a post-print world, which means multiple devices and formats. So our argument will come from barriers we have faced in practice with the way CC-By works are done now and we will show practical ways to overcome such barriers from legal and technical alternative infrastructures. Isin and Ruppert say that digital citizens say with actions (and I would add, also with infrastructures). I think that the upcoming booklet would be an enactive way of argumentation about alternative infrastructures that enable diversity and agency, done from a marginal learning place: a hackerspace in the Global South. i look forward to reading more from you about this. your treatment of the subject is extremely informed, professional and (rarest of all) patient. although i’m not convinced i agree there is a need here, it is rare to find an argument made as thoroughly as yours. for my part, (as a free software and free culture advocate) i will continue to familiarise myself with your side of this debate. ive considered the merits of copyleft for non-software, and always come to the conclusion that “permissive licensing is simply better for non-software works.” im far from alone in this, but it isnt just a numbers game. i still think proliferation is a misfortune, but sometimes a license serves a purpose less served by some other license. 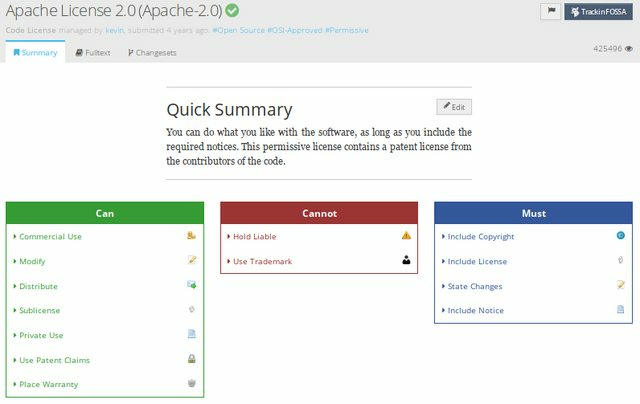 that said, regarding the afl specifically, it was written in 2002 by a former osi counsel, and 4 years later was found by the osi proliferation committee (which i just found out exists, thanks to you) to be “redundant with more popular licenses,” specifically version 2 of the apache software license. you seem to be (if i understood correctly) arguing for the afl for the purposes of copyleft, but the afl (like cc by) is a permissive license-- so the merit of distinguishing “what part is source code” has no purpose that i can tell. with permissive licenses, there is no copyleft and with no copyleft there is no utility in distinguishing what part is “source” as including source is not a requirement of the license. with that said, i dont wish to monopolise the discussion. i will continue to listen to what you have to say, here and on this forum, with interest and admiration for what youre trying to do here. the best of luck, and regards to you. @figosdev In my case I thought that expressing that we care about reciprocity was important not only for software (i.e. GPL in Linux), but for content (i.e. CC-By-SA in Wikipedia), but after trying to extend and modify open content under CC-By licenses, I have found that the real issue is access to the source code, as a minimal way of enabling reciprocity, even if relicensing is possible, in software (Apache) or content (AFL). I’m not arguing AFL because of copyleft, but because their explicit mention of source code requirements. Is good to know they are equivalent with Apache in the freedoms they provide, as the Wikipedia Page shown. I found wording of AFL clearer, maybe this is because I found it well resumed in the TLDRLegal site but now I could go with any of them now. So, after this conversation, I’ll add Apache to my recommended set of licenses enabling such reciprocity in practice (along with stronger ones like GPL or CC-By-SA) or weaker ones that doesn’t care about it and source code: public domain, CC0, CC-By. I think that navigating the diversity of possibilities and concerns for creating OER (for example regarding source code availability without requiring “copyleft” clauses) should be an important part of an OER project, to account for the diversity of communities around such resources. The argumentation I have seen until now has been pretty generic, so thanks @figosdev for participating in this conversation, making it more fine grained. Once I have some advances, I will share them here. @figosdev Yes, I have read both of them, Apache and AFL, completely now. I think both do what I want, but I like AFL wording better. Anyway, both provide the same practical liberties, including access to source code and relicensing, so I can go with any of them, knowing that the transition to the other is painless.